Caesar's Legions laid siege to Vercingetorix's Gallic army in one of the most tactically amazing battles of all time. Outnumbered 6:1, the Romans built siege lines facing inward and outward and prevented the Gauls from breaking the siege. The campaign leading to the battle revealed ingenuity on both sides, though in the end Caesar established his fame in these actions. In 52 BC, Caesar's continued strategy of annihilation had engendered a spirit of desperation, which detonated into a revolt of Gallic tribes under the leadership of the charismatic, young, Arvernian noble, Vercingetorix. Though the Gallic people shared a common language and culture, forging a coalition amongst the fiercely independent tribes was a virtually impossible feat, and it was a tribute to Vercingetorix's personality and skill. Initially Vercingetorix's strategy was to draw the Romans into pitched battle. Vercingetorix was soundly beaten in the open field battle against Caesar at Noviodunum, followed by the Roman sack of Avaricum. However, the action that followed at Gergovia amounted to the most serious reverse that Caesar faced in the whole of the Gallic War. Vercingetorix began a canny policy of small war and defensive maneuvers, which gravely hampered Caesar's movements by cutting off his supplies. For Caesar it was to be a grim summertime - his whole Gallic enterprise faced liquidation. In the event, by brilliant leadership, force of arms, and occasionally sheer luck, Caesar succeeded. This culminated in the siege of Alesia (north of Dijon), which Caesar himself brilliantly narrates (Bellum Gallicum 7.68-89). With his 80,000 warriors and 1,500 horsemen entrenched atop a mesa at Alesia, the star-crossed Vercingetorix believed Alesia was unassailable. Commanding less than 50,000 legionaries and assorted auxiliaries, Caesar nevertheless began the siege. Vercingetorix then dispatched his cavalry to rally reinforcements from across Gaul, and in turn Caesar constructed a contravallation and circumvallation, a double wall of fortifications around Alesia facing toward and away from the oppidum. When the Gallic relief army arrived, the Romans faced the warriors in Alesia plus an alleged 250,000 warriors and 8,000 horsemen attacking from without. Caesar adroitly employed his interior lines, his fortifications, and the greater training and discipline of his men to offset the Gallic advantage, but after two days of heavy fighting, his army was pressed to the breaking point. On the third day, the Gauls, equipped with fascines, scaling ladders and grappling hooks, captured the northwestern angle of the circumvallation, which formed a crucial point in the Roman siege works. In desperation, Caesar personally led the last of his reserves in a do-or-die counterattack, and when his Germanic horsemen outflanked the Gauls and took them in the rear, the battle decisively turned. The mighty relief army was repulsed. Vercingetorix finally admitted defeat, and the entire force surrendered the next day. 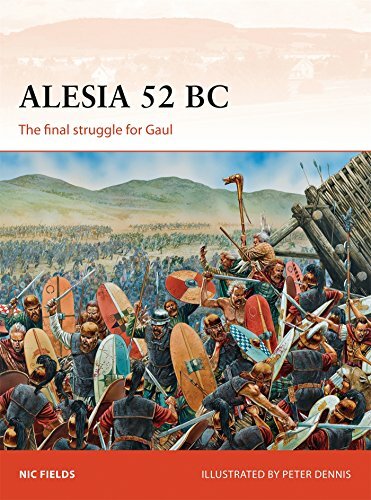 Alesia was to be the last significant resistance to Roman will in Gaul. It involved virtually every Gallic tribe in a disastrous defeat, and there were enough captives for each legionary to be awarded one to sell as a slave. In a very real sense Alesia symbolized the extinction of Gallic liberty. Rebellions would come and go, but never again would a Gallic warlord independent of Rome hold sway over the Celts of Gaul.